Salon Image Gallery, Website and Blog All-in-One ! Click the image above to visit the demonstration Image Gallery Website. A full featured website for those salons who would like to present their photographic collections in the most powerful way possible. Is it a Website ? Is it an Image Gallery ? Is it a Blog ? Yes, Yes, Yes. It's all three-in-one! This website is very flexible, we can develop it as an image blog, a video blog, or a full feature website with all the normal features you would expect including a salon menu. You get what you pay for and you will certainly get your money's worth with a website like this. An image gallery is useful for many reasons, not least to get your artistic skills noticed, but most of all it is for making productive use of the investment you make in your photographic collections. Don't file away the 2009 collection - boast about it in an everlasting archive. A lot of love and passion goes into creating a world class image and there is usually an interesting story behind every successful frame. Our Image Gallery Salon Website allows the website owner to display the image and write the story in the same page. We are always here to help, we will never see our clients struggle. But on the other hand we know you don't want to be paying a webmaster or designers fee every time you want to upload a new image or collection. So this website is completely "owner managed". 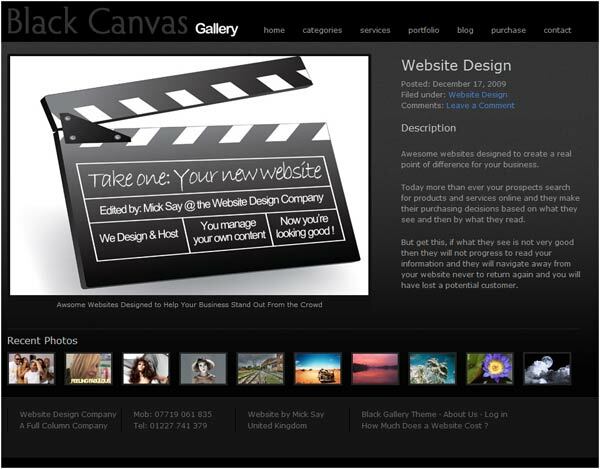 The Image Gallery Website Package is £990.00+ VAT including domain name and hosting. Please contact us if you have any questions or ring Mick on 07719 061 835.